This question comes up in virtually every conversation with prospective customers. Some people seem to think that VoIP (IP) telephones must be the way to go because they are the hot new item. Our view is that the choice of IP sets or digital depends on the specific set of requirements a potential customer has and the communications issues that need to be addressed with the implementation of a new communications system. Great applications for IP phones include integrating employees who frequently work from a home to the office system. Giving remote employees an IP phone makes them an extension off of the office phone system – making it easier for co workers and customers to reach them and eliminating the need for a home “business” line from the phone company. This often also leads to a reduction in cell phone charges. 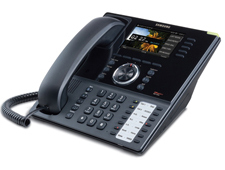 IP phones are also well suited for people who are highly mobile. The Samsung OfficeServ systems offer apps that include softphones, which is simply software that transforms a PC into an IP phone; and pocket size wireless IP handsets. The nice thing about both these devices is they can work off a WIFI connection – providing the flexibility to be an extension off the office phone from virtually anywhere. There is one other application to discuss, and this absolutely requires an IP phone. In environments such as real estate offices and car dealership, multiple people often share the same physical telephone. IP phones support a feature referred to as either hotelling or hot desking. This feature gives multiple users the ability to log into a phone by entering a unique code, and make that shared phone their personal extension number for as long as they will be occupying that workstation.This feature is also very useful in offices where people move around frequently – the extension number remains the same no matter where somebody sits and the move was made without having to pay for a phone technician. If your specific communications requirements don’t need the VoIP applications presented, then digital telephone sets would be our strong recommendation. In my view, there is simply no compelling reason to purchase IP telephones for the office where the phone system is to be installed. IP phones cost more, offer no additional benefits relative to digital sets and are in no way required for enhanced applications such as unified messaging or computer telephony integration (CTI). Implementation of digital sets also allows the reuse of existing telephone wiring, which can represent a huge cost savings. IP sets require computer wiring and need to run over either the existing network or a new network cabling infrastructure for voice. The first of these two alternatives will require an assessment to determine if the existing network will handle the additional load of voice traffic and the installation of managed switches (in most cases) to prioritize the voice packets, while the second means dealing with the expense of rewiring. We have been helping people determine the right way to deploy IP sets for over seven years. The approach we continue to take is to make recommendations based upon the specific set of requirements which need to be addressed. We never want to put our customers in the position of making hi tech, why tech.